I needed to measure the torque and power output of my Stirling engine so that I could compare it with the simulation. The engine currently spins up to 70 RPM and has torque levels up to around 2 in-lbs. 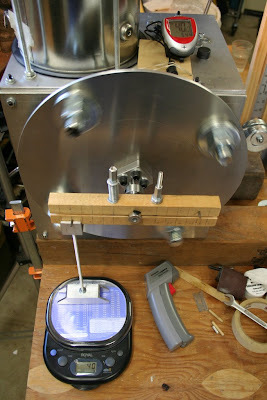 My first attempt at a design to measure torque was easy to make and gave satisfactory results. I believe it would also be suitable for higher RPM and torque levels. Using this torque value in the power equations yields power in in-lbs/sec. To make the torque measurement I locate the vertical column at the torque arm distance I want. For my measurements I use 3 inches and have a pin installed on the torque arm at this distance. Because the vertical column contacts the pin I don’t need precise lateral alignment on the torque arm. Make sure the torque arm is horizontal when making the measurements. The digital scale is convenient for making these measurements because it has very small displacement unlike a beam balance or spring scale. Raise the torque arm off the vertical column and tare the scale. Lower the torque arm onto the vertical column and read the force on the scale. 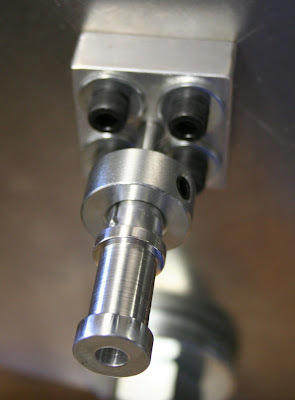 To make accurate measurements the torque arm should be balanced on the shaft axis. You can also test this by making torque measurement then letting the torque arm rotate 180 degrees and making another torque measurement. They should be identical. On my torque arm I’ve balanced the asymmetrical weight of the spring with additional washers and have a matching pin on the opposite side of the torque arm. I experience very little drift in the measurements unless the RPM varies considerably. This only happens at low RPM (under 30 RPM on my engine) when torque levels are high and the flywheel inertia slows down between power pulses. The torque arm assembly only requires a few parts. The sleeve is the most complex part and was made using a lathe. It could also be made from metal tubing and two collars. The sleeve is made to have a slip fit on the engine shaft (.25 inch on my engine). The outside diameter of the sleeve has two 5/8 inch diameter shoulders to keep the wood torque arm from sliding in or out on the sleeve as it turns. The diameter where the torque arm rides is ½ inch. The sleeve needs to lock firmly on the engine shaft to transmit the torque. I split the sleeve and used a collar to squeeze the split region against the engine shaft. The wood torque arm started as one piece of .75×1.5×8 inch wood. I drilled a ½ inch central hole to match the sleeve OD between the shoulders and two holes for the bolts that squeeze the torque arm halves together. I also marked the radial distances out on the torque arm for locating the vertical column when making torque measurements. After that I used a table saw to rip the torque arm in half right through the center of the sleeve hole. If you don’t have a table saw for the ripping operation you could just make the torque arm from two pieces to start with. I originally had the wood torque arm rub directly on the collar and this worked reasonably well but set up an annoying squeak at low RPM. I’ve since inserted felt which avoids the squeak but requires more squeeze force to get the same friction. 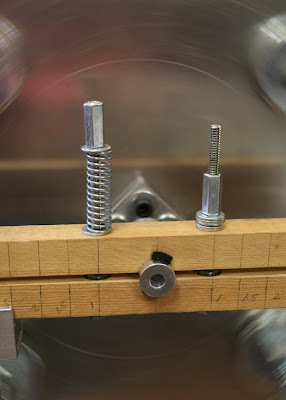 The bolts used to apply clamping force to the torque arm are just threaded rod with nuts and washers sandwiching the lower part of the torque arm. I use barrel nuts on the top for easy finger adjustment. On one side I fix the clamping bolt for an even gap in the torque arm and then make all the torque adjustments on the other side by compressing the spring with the clamping bolt to build force gradually for fine adjustment. 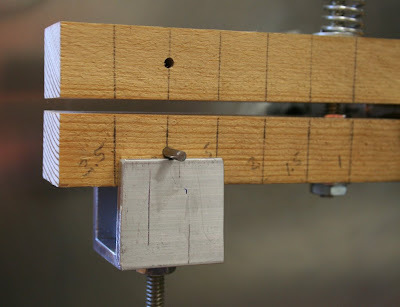 The vertical column used to transmit the force on the torque arm to the scale was made from two pieces of U-channel connected by a threaded rod. The rod is cut to length to make the torque arm horizontal. 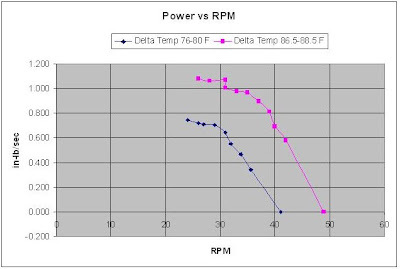 The following two plots show the results of some torque and power measurements on my engine. The data isn’t dead smooth and this could be from several causes. Changing power levels on the engine cause some drift. It’s difficult to keep the temperatures constant on this engine while changing the load. The torque measurements seem reasonably stable except at very low RPM. The RPM measurement gets more difficult at low RPM because it varies throughout a cycle and I have to try to average several RPM readings. One difficulty I’ve experienced is a zero drift on the digital scale. It’s usually quite stable but will sometimes drift a few grams. It’s best to check the zero reading before and after a measurement. The power levels for my measurements have been less than one watt (8.85 in-lbs/sec = 1 watt) so I don’t have a big power dissipation problem. There is no reason you can’t scale up the design I have used here to measure higher torque and power levels (at higher RPMs too) as long as you pay attention to the power dissipation. I have used an aluminum sleeve for easy machining and good heat conductivity. Although I haven’t tested it, I expect this design should be able to handle at least 2 watts at 100 RPM or higher. Scaling up the design for more contact area between the wood and the sleeve and more exposed surface area on the sleeve to get the heat into the air would be desirable for higher powers. The wood will not conduct heat away very efficiently and will be the weak link. You should be able to smell trouble if you get it too hot. Too much power coming out of my engine for the torque system to handle is a problem I’d love to have. When it happens I’ll let you know how I solve it.